We're tracking the prices for all Nintendo Power Issues. From Volume 1 to Volume 285. You can find the latest prices and add the issues to your collection too. Who here owns the entire Nintendo Power collection? Anyone collect other gaming magazines like EGM, Game Informer, GamePro, or Sega Visions? Let me know which you collect in the comments below. When choosing a new gaming headset, there are several things you want to consider. Comfort, sound, your platform, durability, and price are all top points to take into consideration. While you can certainly grab just about any pair from your local store, if you are a die-hard gamer, who plays for hours on end, you will want to be a bit more particular. Here are some tips to help you get the best pair for the best gaming experience. If you are a serious gamer and play often, or for long periods of time, you want a headset that is comfortable. Find something that is lightweight yet substantially cushioned to avoid ear pain. Also make sure that the spacer (the area between the two ear pieces) is correct. If you have a headset that is too small in size, it will be tight and uncomfortable. On the contrary, if the headset is too large, it may fall off easily, becoming a distraction, or inhibit your hearing ability. The cheapest headset may not be the best quality. Likewise, the most expensive set may have everything you need or may have features that you likely won’t use. Why pay for something you don’t need? Do your homework before making a purchase. Find out exactly what you want in a headset and then what the price range of a headset like that will cost. If you are going for a specific look, take that into consideration, too. Shop around and look for coupons or discount codes. There are great deals out there. Headphones are designed to give you close and in-person-like hearing ability. If the sound is horrible, then there’s no point in wearing them. A good headset will have volume and bass controls, as well as a noise cancelling feature. You don’t want your little sisters high pitched screaming interfering with your war game when you need to concentrate. Great sound can make a good game even better. If you like to play game with a team, you will want a microphone. 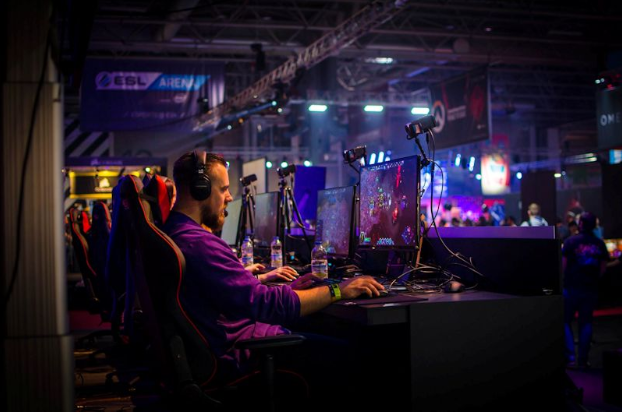 Multiplayer online gaming platforms allow you to talk to team members and strategize. A quality microphone will allow your voice to be clear and loud for teammates to hear you. A good mic will make your in-game missions a breeze. A serious gamer wants a high-quality design. You want something that can withstand being taken on and off frequently, as well as one that will tolerate getting thrown in frustration from time to time. You don’t want your headset to break or have the connections come loose the first time they accidentally hit the ground. Get one that is built to last. Some headsets may be designed for specific platforms. Depending on whether you are playing on a PC, Xbox, Nintendo, or another device, you will want to make sure that your headset is compatible. Choose the wrong headset and you will just be wasting your money on something that you cannot use. If you don’t want to worry about having to recharge your headset in the middle of your game play, you will want to strongly consider if you want a wired or wireless headset. If you don’t want wires getting in your way, then wireless is a good option. Also take into consideration connect-ability. If you choose wireless, and there is interference in the room, it may disrupt the sound quality of your game. There are pros and cons to each. Some gamers like to have a set of each. What kind of gamer you are will determine what type of headset you may want to get to use with your gaming system. Comfort, sound, and price are just some of the things that you will want to take into consideration. 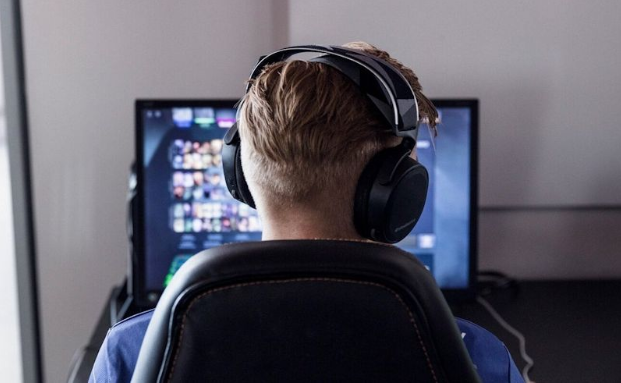 The right headset will definitely elevate your game. Many of our users help us fix data or cover art mistakes on the site. They used to email us and wait for us to make the fix. Now users can edit data themselves. You can apply to be Contributors and get permissions to improve PriceCharting for everyone. For this new feature we added a section for additional photos of games. 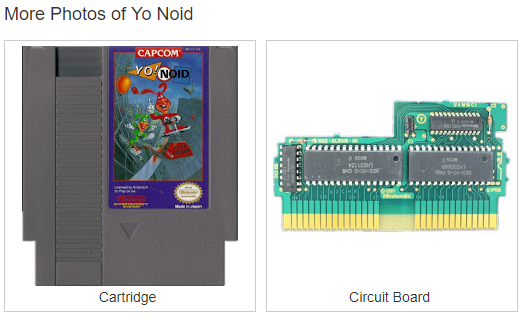 Instead of just showing cover art, you can see the cartridge/disc, circuit boards, limited edition pack-ins, etc. If you have any of this data and we are missing it, please add it yourself. We're working to add lots of the images on our end too. 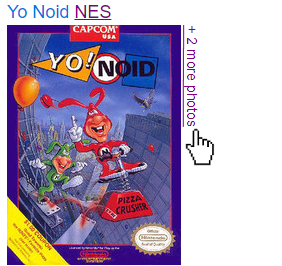 If additional images are available, a "+ X more photos" message appears next to the cover art. 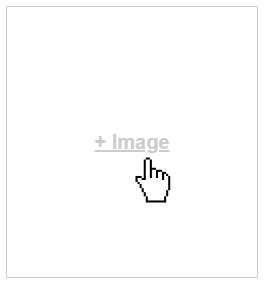 Clicking that takes you directly to the other images. Admin are notified of every change and can revert them easily if needed and revoke contribution permissions if needed. Do you have a favorite video game publisher? Nintendo, Rockstar, Atlus, Konami, etc. 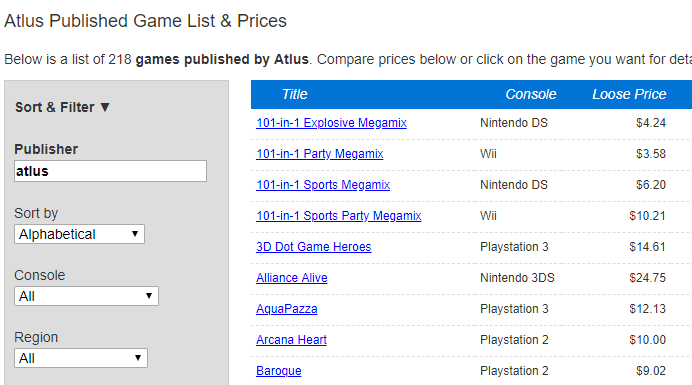 You can search PriceCharting by Publisher to find all their games and their prices. Want to collect of every Capcom game? Add the Capcom games to your collection with one click and see which Capcom games are missing from your collection in a quick glance. We're working to add the same feature for game developers but we need to add more data points to our database before we are ready to launch it. If you want to help, contact us and we an give you access to edit the database. Please give us your feedback on this new feature. 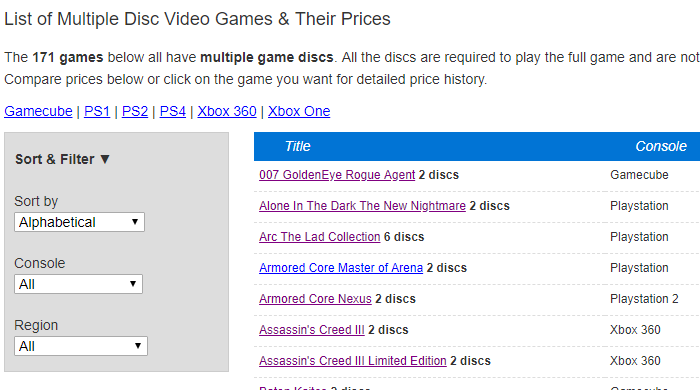 We also added a list of every multi-disc game for every console. 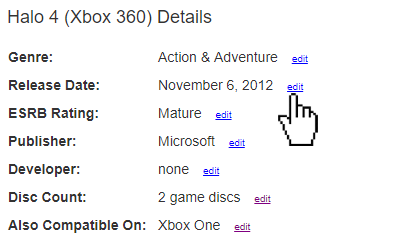 Use this as a quick tool to make sure games you find are complete with all the discs. 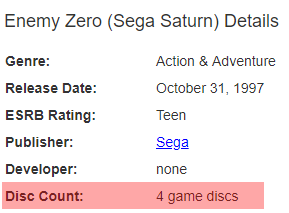 The "Item Details" section on every disc game page lists the number of discs included.